The best espresso machines aren’t always the most expensive. Price isn’t always an assurance of quality. Sure, some higher priced models may have better more advanced features, but is it really what you need? When shopping for espresso machines, you need to take your goals and needs into consideration. Don’t let yourself be blinded by an espresso machine with a hefty price tag. Make sure that you check the features and feedback to see which one best suits your needs. It’s easy to spend thousands of dollars on an espresso machine in the hopes of making cafe quality beverages at home. You don’t need to invest on top-of-the-line coffee equipment to create the best tasting cup of joe. 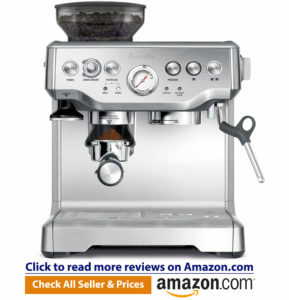 In fact, you can get a decent espresso machine for less than $500. With this budget, you aren’t really looking into entry-level espresso machines. With a little bit of practice and good quality coffee beans, you’ll be on your way to making cups after cups of great tasting coffee at home. If you are an aspiring home barista, who is looking to explore the art of espresso making, then this blog post is for you. Here are our top picks for the best espresso machines under $500. If you are looking to take your espresso game up a few rungs, the Dedica may be just what you need. The Dedica offers a beautiful exterior. It has a sleek design that is both compact and elegant looking, with plenty of shiny stamped metal and faux-chrome plastic. The EC680 is 15-bar pump espresso. With the right technique and quality ingredients, you can expect the same quality espresso you would expect from your local coffee shop. It also features a thermo block technology that heats the machine in as little as 40 seconds. Plus, it offers simple operation. The control panel comes with 3 illuminated buttons that activates single shot brewing, double shot brewing, and steam. The coffee maker automatically and reliably pulls tasty espresso shots. 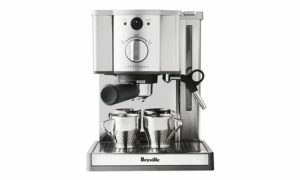 Breville is one of the most talked about brands when it comes to the best espresso machines, and for good reasons. They manufactured some of the best espresso machines on the market. Not only are these machines of good quality, they are also quite affordable. 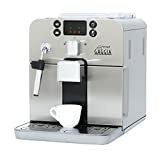 If you are considering buying an espresso machine and you are eyeing on this brand, the Cafe Roma is worth the money. It’s a low-priced alternative to the higher end models, but the quality is undeniable. 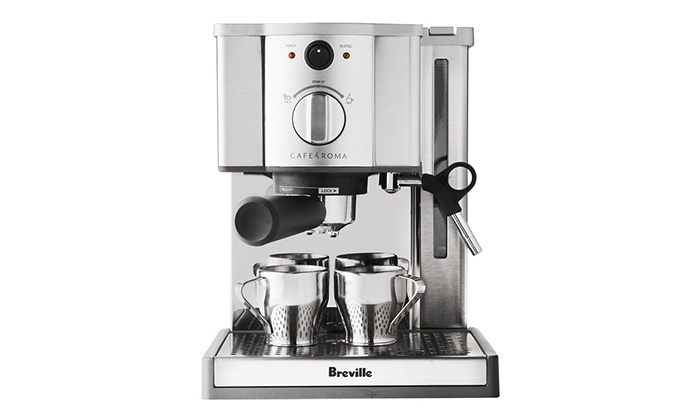 The Breville Cafe Roma is perfect for home baristas who don’t have enough a lot of room in their kitchen. Measuring 12 inches x 12 inches, this machine is so compact, it won’t take up much space on your kitchen counter. With its stainless steel body, it will certainly capture the attention of anyone who sees it. The Cafe Roma has a thermo-block pump that ensures it reaches the optimal espresso extracting temperature in no time. The frother is also a great addition. It makes such wonderful crema at a push of a button. This machine isn’t just limited to making espressos. In fact, you can serve up some lattes and cappuccinos to your family and friends. With this coffee machine, you’ll be able to make cafe quality espresso as if you’re a professional barista. You’ll be able to impress anyone who comes and visit you. Gaggia is a popular Italian brand that is known for their excellent quality. The Gaggia Classic is on their bestsellers. It may be more expensive than the first two espresso machines on the list, but the Gaggia Classic is definitely a great investment that will last for several years. The Gaggia 1401 Classic is a tweaked version of the classic model that has been around for decades. It combines classic design with advanced technology. This model comes with a stainless steel boiler. It may be a little less powerful as compared to the original, but you can be sure that you won’t be dealing with corrosion issues down the road. Unlike the Breville Cafe Roma, the Gaggia Classis is ideal for the purists. It is designed to create espresso only. If you are to look at it, it is quite obvious since it can only accommodate little cups. It’s the perfect choice for those who are revving up for a lifetime of coffee snobbery. With its rugged construction and commercial-grade quality, this machine is designed for longevity. What’s more, it makes rich, delicious coffee that will have you hopping out of bed every morning. In fact, it produces some of the best tasting espressos you can get at this price point. 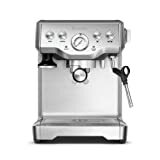 Breville created the infuser for coffee lovers out there who is looking for the best espresso machines that offer control and stability without breaking the bank. It is packed full of high technology and performs at a high efficiency. It has features that are automatically built into the machine, which would allow the users to control every aspect of the brewing process. The level of personalization and personal involvement really allows you to fine tune your brewing experience. The coffee maker comes with a PID and thermocol control, which makes it great at regulating temperature. It guarantees stable temperature for ideal shots. It also features a stainless steel steam wand for effortless milk texturing. Another exciting feature is the pre-infusion function. This feature is usually found in more high-end espresso machines. The grounds are slightly soaked at the start of the extraction; thereby, extraction a more even and flavorful shot.